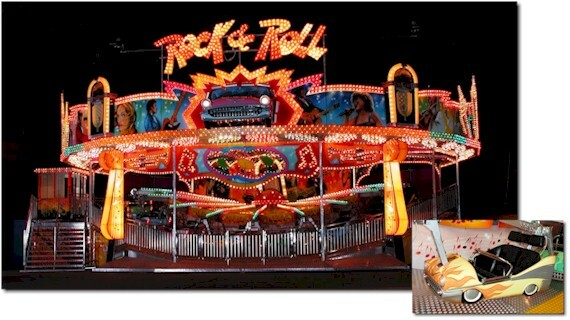 of our "Rock-N-Roll" themed Matterhorn. 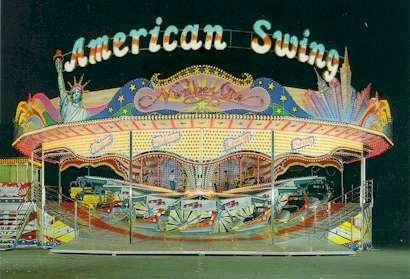 Standard Features: Circular track with two dips and two hills; hot-dip galvanized steel structure; 20 cars connected to the central rotor by radial sweeps; aluminum tread plate around car loading area; electrical and pneumatic equipment fitted to the interior of the central body on which the central rotor is fixed; decorative panels coated with aluminum sheet; electronically operated lighting; fire-proof (class 2) canvas top; car movement is operated by 2 self-braking AC motors controlled by a static frequency converter. Park Model Features: Central body of the ride consists of metalic box-shaped structure to be bolted to the foundation; the roof structure is supported by one central column and ten struts along the perimeter of the ride. Portable Model Features: Central body of the ride consists of either a two axle semi trailer or a 3 axle trailer (11 mt or 36 feet); the roof structure is supported by one central hydraulic column which is fixed to the trailer, and 10 struts along the perimeter of the ride; a second trailer is needed for the transportation of the cars and scenery materials. 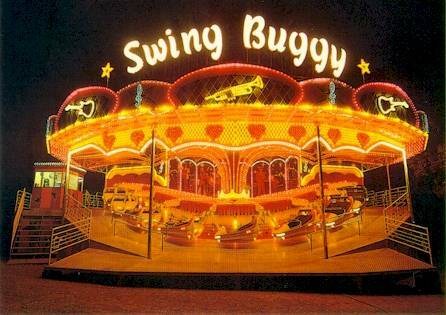 Optionals: Back scenery with lighting, spotlights and sign; custom painting or theming per customer's request; set-up supervision.